As the Illuminated River Foundation’s technical lighting designers and electrical engineers, Atelier Ten have been involved from the beginning as part of Leo Villareal’s winning team. Our aim from day one has been to ensure the lighting design minimises light pollution, sky-glow and light spill into the river and its surrounding areas and neighbourhoods. What has been great about being involved from such an early stage is that we’ve been able to have a lot of input into the design. One of the first things we did before the visuals were created was to complete a luminance survey of the Thames, to address what the current lighting situation was and use it as a marker from which to make improvements. Nothing on this scale had been attempted before and we believe this is the first luminance survey undertaken for a broad stretch of the Thames. Over two weeks, my colleague Wes and I photographed every bridge and the surrounding banksides using Luminance IQ, a specialist software from Germany that converts photos into calibrated false colour images to reveal levels of luminance (brightness). As it was mid-summer, we had to wait until dark so ended up working late into the night. People were very intrigued as to what we were up to. We met late-night joggers and early-hours mudlarkers, and gained a new appreciation for this unique environment and what it means to Londoners. We also gained a new appreciation for good pub toilets, which we can now expertly map along the river. Our hairiest moment was probably photographing the bankside outside MI6 and hoping we didn’t look too suspicious. Current luminance levels and light spill on Albert Bridge: ‘In many cases, we found that the bridges were lit to very high levels and we will be working hard to lower these levels’. From the survey, we were able to plot luminance levels along the river, assessing the brightness distribution on and around the bridges in order to identify the most appropriate luminance level for each bridge. For this project, we wanted to make sure we were using just the right amount of light on the bridges so that they will stand out against, but not overpower their surroundings. Equally, we are acutely aware of the potential harm that spill light can cause and so wanted to ensure light is targeted on the bridges and not into the river or surrounding areas – the right kind of light in the right places. In many cases, we found that the bridges were lit to very high levels and will be working hard to lower these levels without loss of visual impact. Luminance study of the Thames bankside: ‘We completed a luminance survey of the bridges and their surroundings; nothing on this scale had been attempted before’. Wes and I also carried out a light spill survey to assess how much direct light from the bridges was currently spilling onto the Thames. Hanging out of a boat, (kindly borrowed from the City of London), we whizzed along the river and under bridges with our light meter, some doughnuts and paper cups of tea. While we were really able to take in the full beauty and history of the bridges, which have some truly remarkable latticework on their undersides, we were shocked by some of the current levels of light spill. Albert, Tower and London Bridges all have very high levels of spill which are significantly over recommended levels. Albert Bridge, in particular, throws out more than 20 lux, the kind of light levels you would expect to find on a motorway, not a river. We are confident that the design of the new lighting scheme will be able to reduce this spill by three quarters. 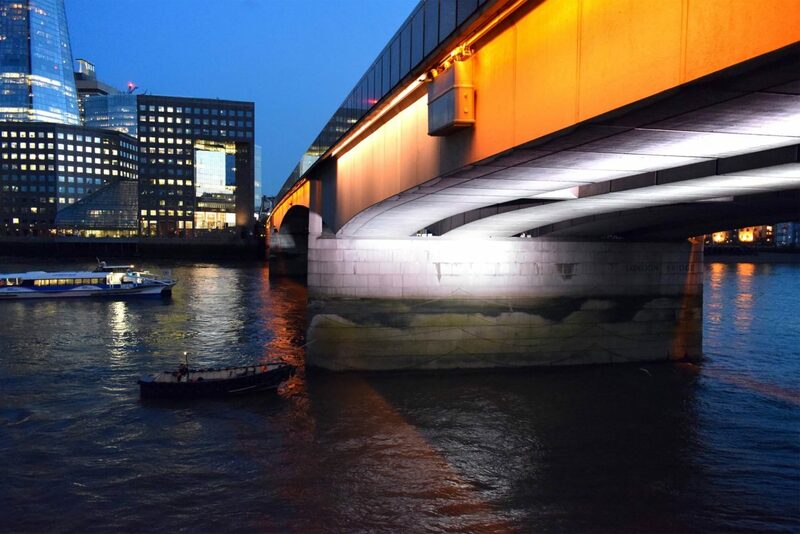 We also discovered that in many areas, such as the area surrounding Southwark Bridge, a lot of the light spill into the river was coming from street lights and over-lit buildings. Our research has helped to inform the design process. Simply by using LED light sources we will be able to make energy savings. For example, on Albert Bridge we will reduce energy usage by up to 70% while keeping the much loved lighting effect. Leo’s artistic vision of gently kinetic and subtle movement also means that the lighting will typically only be run at thirty percent of its full output, resulting in further energy savings. The beauty of modern LED lighting is that we are able to select lenses for the light fittings that are individually optimised to focus light only where it is required on the bridge. We are also working with the team to design custom shields that will be fitted to the lighting and adjusted to significantly reduce spill light into the river, which is very harmful to fish. On some bridges, such as London Bridge, this means we can reduce light spill significantly. Another great thing about this project has been working closely with our partners, such as the Zoological Society London and other ecology specialists, to learn about how light levels affect Thames wildlife and ecology, and collaborate on shared solutions. For example, we were able to work with Dan from Thompson Unicomarine to check the impact of light on bats, and we learnt from Anna Cucknell, Marine and Freshwater Conservationist at ZSL, that much like (some humans) the one hundred and twenty five species of fish that inhabit the Thames don’t very much like breeding with the lights on either! Through these collaborations, we have been able to come up with a lighting scheme that respects these more oft-forgotten river residents. Through this project, I have gained a new appreciation for the river and its bridges, not to mention having had some unusual experiences that I never would have otherwise. I have crawled inside London Bridge equipped with breathing apparatus and a harness to look at the cable routes (who would have known that it is actually hollow inside… or quite how much it trembles if you stand in the middle!) and I have hung off of bridges in human-sized ‘gantry’ buckets during lighting tests. Most importantly, though, right from the inception of the Illuminated River project we have worked to demonstrate how you can reduce light pollution and light spill, while still achieving beautiful artwork that enhances the public realm.